Most nationals in all countries except Lebanon self-identify as culturally conservative. 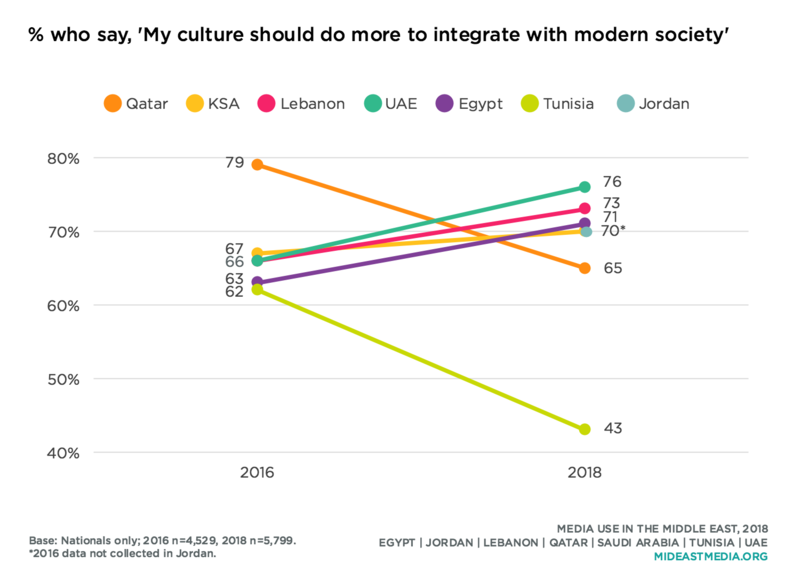 Seven in 10 Jordanians, Qataris, and Saudis—and six in 10 Egyptians—say they are either somewhat or very culturally conservative compared to other nationals in their country. Lebanese self-identify as culturally conservative, progressive, or neither with near equivalent frequency. From 2017 to 2018 the proportion of cultural conservatives grew in five of the seven surveyed countries. This proportion grew somewhat in Jordan and by 20 percentage points or more in Egypt, Qatar, and Saudi Arabia. This could indicate that nationals in these countries are either becoming more conservative or nationals feel their compatriots are more comparatively liberal, or some combination of both. Older Arab nationals are more likely to consider themselves culturally conservative than younger Arab nationals, but even half of the youngest respondents describe themselves as conservative (52% 18-24 years old, 56% 25-34, 59% 35-44, 66% 45+). That said, nearly three times as many of the youngest cohort as the oldest age group identify as progressive (21% 18-24 years old, 18% 25-34, 12% 35-44, 8% 45+). 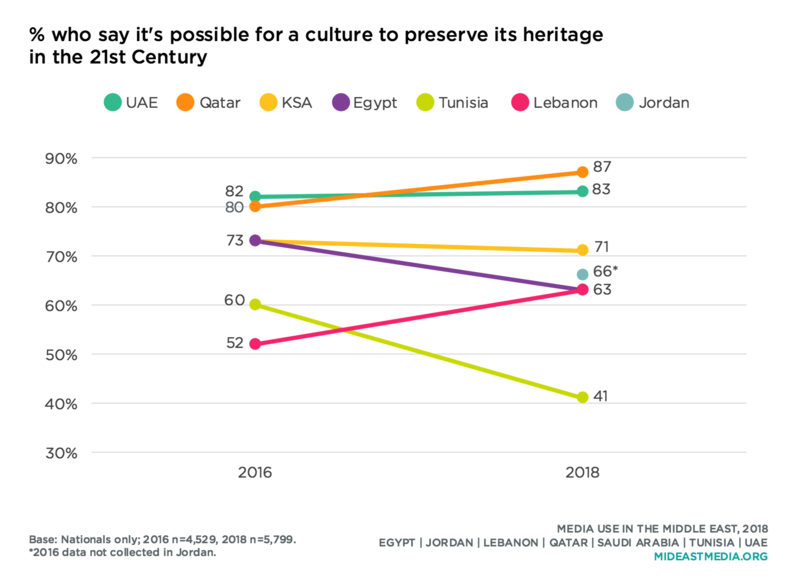 At once, Arab nationals want greater preservation of their own culture while also saying their culture should do more to embrace modernity. Large majorities of nationals in five countries, at least three-fourths, say more should be done to preserve cultural traditions. At least two-thirds of nationals in all countries except Tunisia say their culture should do more to integrate with modern society. Still, agreement with this statement dropped significantly since 2016 among Qataris and Tunisians, while increasing among Egyptians, Lebanese, and Emiratis. Conservatives and progressives do not differ much in attitudes about preserving cultural traditions or increasing integrating with modernity. Between six and seven in 10 of both conservatives and progressives say more should be done to preserve cultural traditions, and also that their culture should do more to integrate with modern society (preserve cultural traditions: conservative 74%, progressive 64%; integrate with modern society: conservative 64%, progressive 67%). Fewer of the least educated nationals (primary school or less) favor more cultural integration with modernity, but still more than half agree (55%). 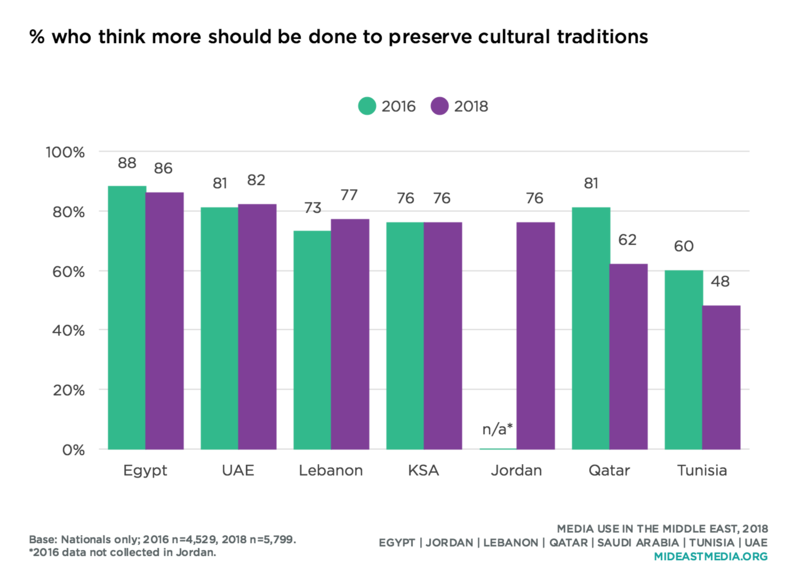 More than half of nationals in all countries say preserving culture in modern times is possible, and agreement is highest in Qatar and the UAE. Tunisia is a lone outlier, as just four in 10 agree—a significant decline since 2016. 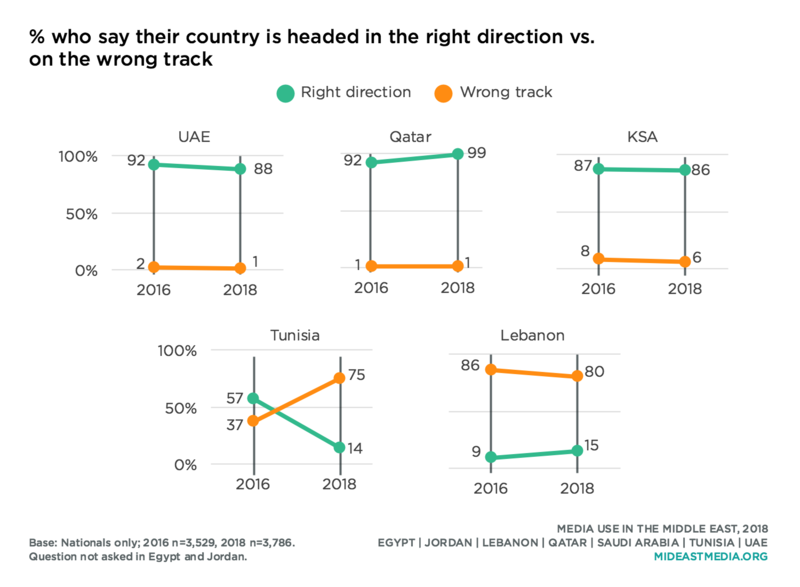 Clear majorities of Emiratis, Saudis, and Qataris say their respective country is headed in the right direction, figures that have changed little in each country since 2013. Conversely, approximately eight in 10 Lebanese and Tunisians say their country is on the wrong track. This question was not permitted by officials in Egypt or Jordan. 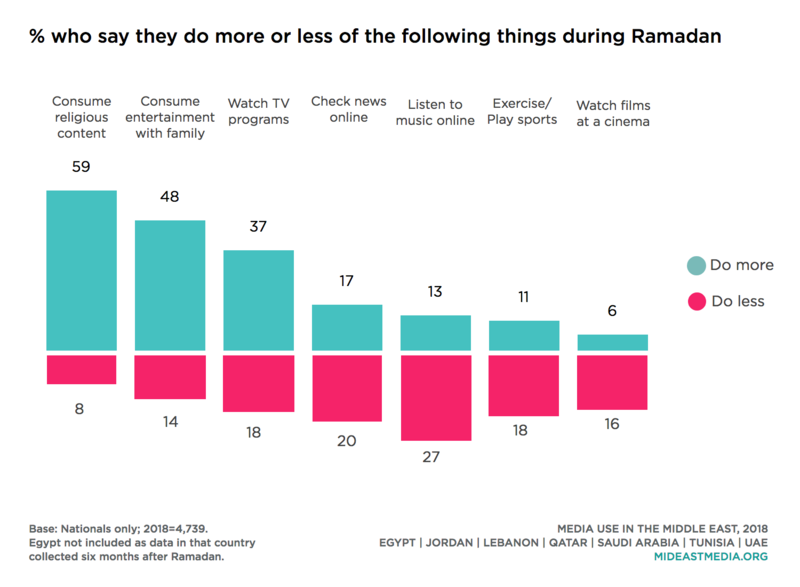 During Ramadan, content preferences shift, as a majority of Arab nationals report accessing more religious content, and close to half consume more entertainment content with family. Nearly four in 10 Arab nationals increase their TV use. 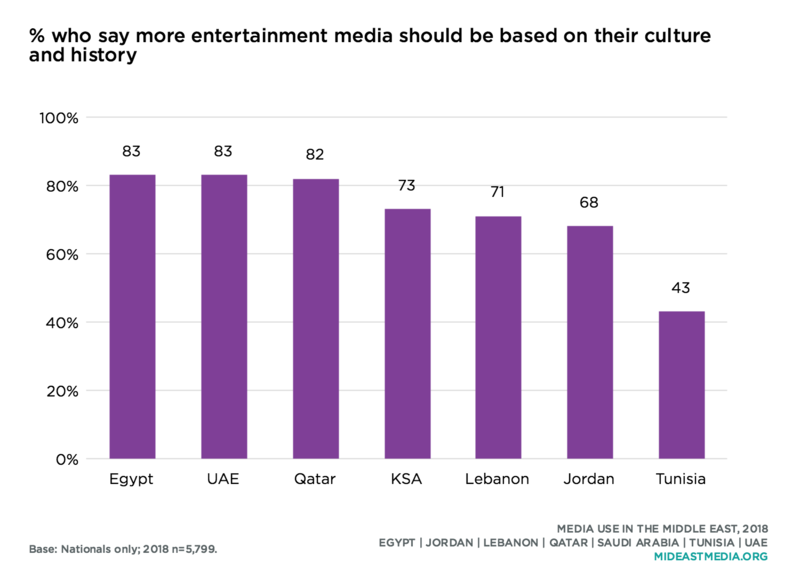 Concerning entertainment attitudes, at least two-thirds of Arab nationals, again except for Tunisia, say more entertainment media should be based on their history and culture. Egyptians, Emiratis, and Qataris are the most likely to agree. 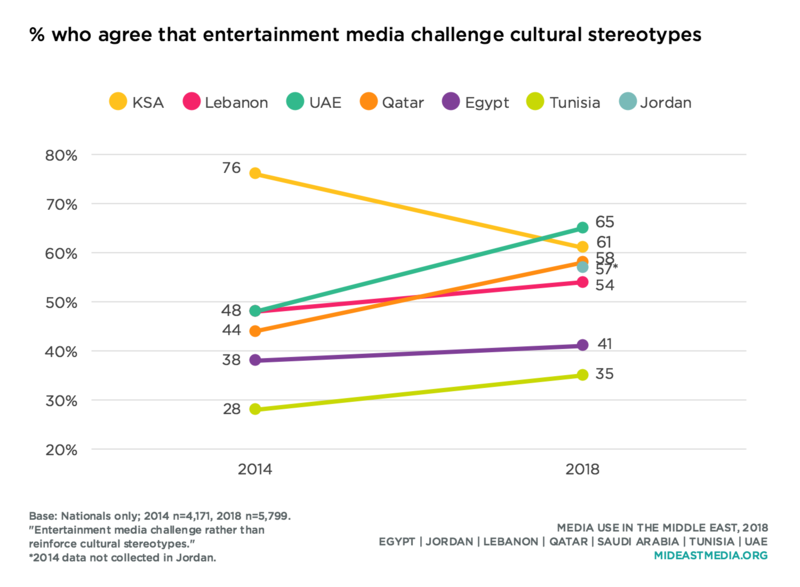 Additionally, majorities of nationals in most countries think entertainment media challenge cultural stereotypes, a more common sentiment in all countries over the past two years except Egypt and Tunisia, where fewer than half of nationals agree, a decline in agreement between 2016 and 2018. About half of both conservatives and progressives say entertainment media challenge cultural stereotypes (50% conservative vs. 48% progressive). Most nationals in all countries except Tunisia say they prefer watching films about their own culture, and that films are an important source of information about one’s own culture. While progressives are a bit less likely than conservatives to prefer films about their own culture, more progressives than conservatives say films are an important source of information about one’s culture (I prefer to watch films that portray my own culture: 70% conservative vs. 57% progressive; films are an important source of information about one’s own culture: 58% conservative vs. 64% progressive). While Arab nationals prefer entertainment content about their own culture, most nationals in all countries also say people benefit from watching entertainment content from other parts of the world, including at least seven in 10 Emiratis, Lebanese, Saudis, and Qataris (Tunisia, at 43% agreement, is again the lone holdout). 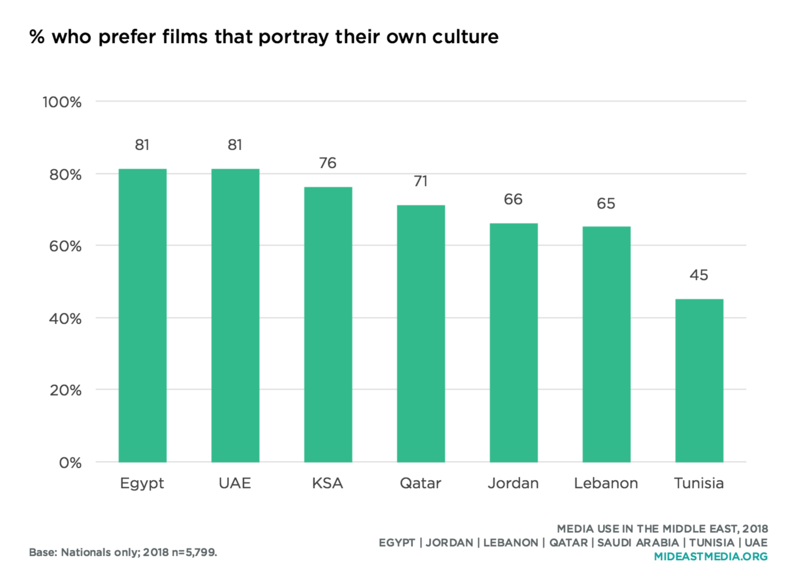 Growing percentages of Lebanese, Emiratis, and Saudis say some of the films and TV programs they would like to watch are not available in their country. The proportion of Qataris and Egyptians who agree with this statement dropped sharply since 2016. At least a third of nationals in each country say some of their favorite TV shows are in a language other than Arabic.This figure grew to over half of Emiratis and Lebanese, and to nearly two-thirds of Saudis, between 2016 and 2018. The one exception is Egypt, where fewer than three in 10 agree—a sharp decline from 2016. Cultural progressives are more likely than cultural conservatives to say some of their favorite TV programming is in a language other than Arabic (54% progressive vs. 41% conservative). 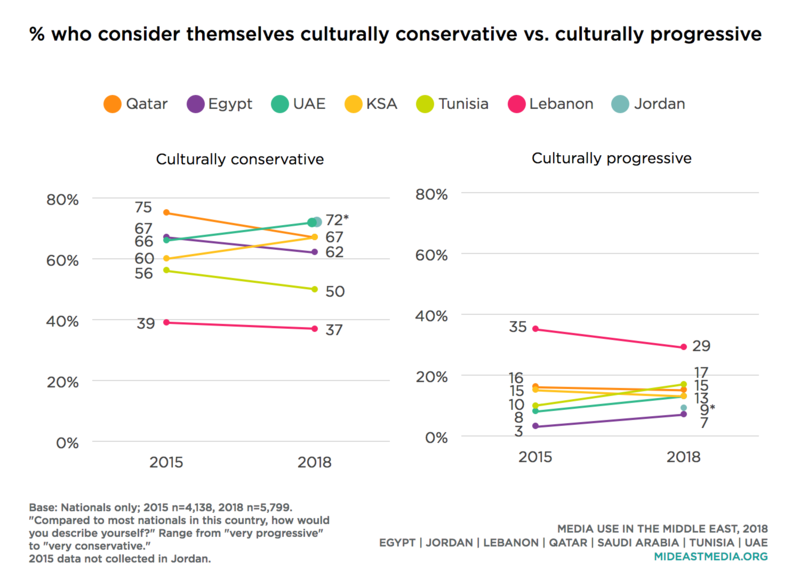 Cultural conservatives are as likely as cultural progressives to say Arab entertainment content is good for morality, but are less likely than progressives to say content from the U.S. and Europe are good for morality (films and TV from the Arab world in general are good for morality: 46% progressive vs. 46% conservative; from Hollywood/US: 42% progressive vs. 30% conservative; from Europe: 39% progressive vs. 27% conservative). At the same time, nationals in all countries except Tunisia tend to agree that government oversight improves the quality of entertainment. Similar numbers of cultural conservatives and progressives agree (52% conservative, 53% progressive). When asked about the portrayal of various locales in international film and TV, there is some variation across countries. Nationals in Arab Gulf countries are more likely to say their country is portrayed too positively than to say it it is represented too negatively, while the opposite is true for nationals from the middle income countries—Lebanon, Tunisia, Egypt—who are more likely to say their country is portrayed too negatively. 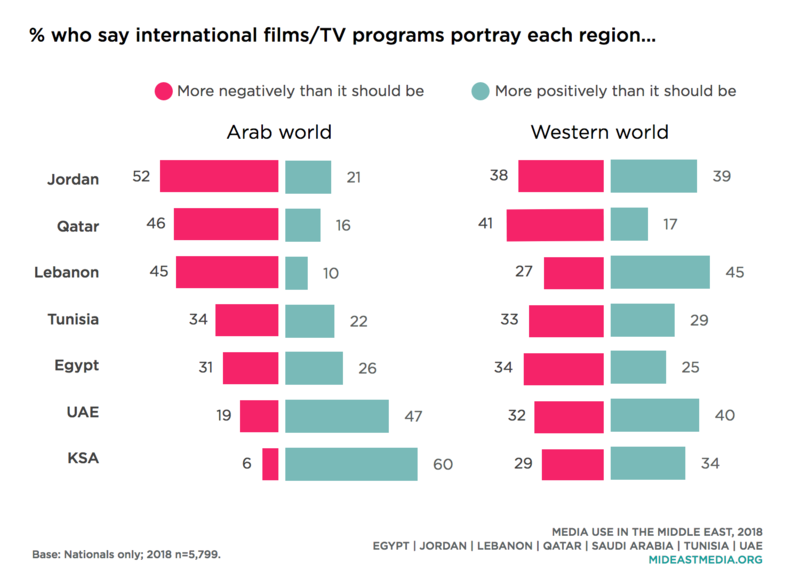 Saudis and Emiratis are more likely than other nationals to say international TV and film portray the Arab world positively, rather than negatively, by more than two to one. Perceptions of how they portray the Western world are fairly evenly split in all countries except in Qatar and Egypt, where nationals more often say the Western world is portrayed too negatively, and in Lebanon, more nationals say the Western world is portrayed too positively. Nationals with more education are more likely than less-educated nationals to say both their own country and the Western world are portrayed more positively than they should be (country of residence: 24% primary or less, 28% intermediate, 33% secondary, 34% university or more; Western world: 18% primary or less, 30% intermediate, 35% secondary, 39% university or more).